Often I hear people say they would like to cook eggplant but they don’t know how. I also hear a lot of people say you have to get the water out of eggplant before you cook it. Well, I would like to try cooking it another way because the only way I know how is to roast it, of course. Recently I bought some eggplant specifically to cube it and sautee it to see how that would be. But when I started thinking about how yummy it is roasted, I opted for roasting it. 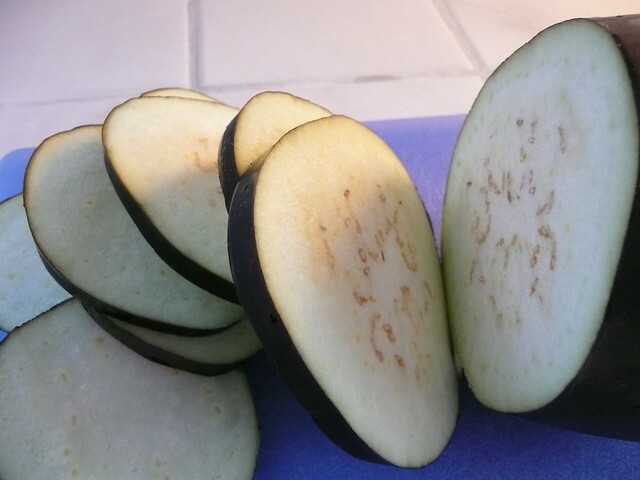 I have used Japanese eggplant, which it nice because it has less seeds. It is also nice because it is more evenly shaped so all the slices come out basically the same size so they cook at a more even rate. I typically use the large pear-ish shaped eggplant. The last time I bought it, the store clerk said she had always wanted to try it but didn’t know how to cook it (see, I told you people tell me that). So I decided to share my way of cooking it. You know I love to roast veggies. Roasting veggies is so easy because you can put them on and work on cooking the rest of dinner. I was so busy cooking the rest of dinner I forgot to take pictures of the roasted eggplant. I remembered to take pictures of it as I sliced it, but I forgot to do it after it was cooked. I slice at about 3/8 of an inch. I put olive oil on the pan (I use a cookie sheet), then place the slices on the pan in rows, then I drizzle a little olive oil on the slices. I sprinkle garlic powder on each slice. Then I sprinkle salt on each slice. The salt will help release the water. Pretty much the same way as sweating the vegetables, but the water will evaporate in the oven. I usually cook them for about 15 or twenty minutes at 400 degrees. Then I flip them over. I usually add more seasoning. It depend on how much salt I put on before. I might add more or not. I put them back in the oven. How long depends on how they look. Often times they don’t cook evenly so some will be done where others will not. So I take the done ones off the pan, then I set the timer for the time I guess that the next ones will be done. When that time is up I take the done ones off the cookie sheet and put the pan back in the oven. Depending on how they are cooking, I might flip them. It is a process. You have to watch them a bit. That is why it is good to have other stuff to be cooking in the kitchen. You also have to decide HOW cooked you like them. You can cook them just a little until they are still really soft and doughy or you can cook them until they are crispy–almost like potato chips. I like mine crispy. A friend on FB said she puts cheese on the slices. That would be excellent. I haven’t tried that. I am sure it is really good. I don’t squeeze out the water before cooking and I don’t take out the seeds. I also do not cook it for a set amount of time. I start with 15 minutes and go from there. It is best to decide as you go along. I did not realize that eggplant is a fruit, a berry in fact. I don’t think in terms of botany. I just think in terms of eating and cooking. The information I saw said eggplant is a fruit that is used in cooking like a vegetable. So yeah, I think of it as a vegetable. So that is how I cook eggplant 🙂 pretty much how I cook all my vegetables. What about you? Do you cook eggplant? How? I really would like to try it other ways, but I don’t know how to cook it aside from roasting it. Did you know it is a fruit? Did you know it is a berry? This entry was posted on August 4, 2011 at 2:10 pm	and is filed under "Recipes", Food. Tagged: aubergine, cheesy vegetables, easy veggie, eggplant, Facebook, olive oil, oven roasted, potato chips, roasted eggplant, roasted vegetables. You can follow any responses to this entry through the RSS 2.0 feed. You can leave a response, or trackback from your own site. I just recently became a vegan and it’s delicious if you slice it like you did, dip it in flour, then almond milk, then bread it and lightly fry it and then put marinara sauce on top. It’s soooo yummy like that! And you don’t have to put salt on it and let it drain or pull out the liquid first. Yeah, pretty much anything is good breaded and fried. It looks gorgeous in your picture! You’re only three days in. I hope that you find what you seek on you vegan path. Thank you for stopping by. I hope you check in again. I am sure there are a lot of things you can do with it. A lot of ways to cook it. I am just a fan of roasting. It is easy to do and I can put my attention elsewhere and it doesn’t require a sauce or a topping.